NPR - "Entertainment Weekly - Kirkus Reviews - The Christian Science Monitor"
In the picturesque village of Guzman, Spain, in a cave dug into a hillside on the edge of town, an ancient door leads to a cramped limestone chamber known as "the telling room." Containing nothing but a wooden table and two benches, this is where villagers have gathered for centuries to share their stories and secrets--usually accompanied by copious amounts of wine. It was here, in the summer of 2000, that Michael Paterniti found himself listening to a larger-than-life Spanish cheesemaker named Ambrosio Molinos de las Heras as he spun an odd and compelling tale about a piece of cheese. An unusual piece of cheese. Made from an old family recipe, Ambrosio's cheese was reputed to be among the finest in the world, and was said to hold mystical qualities. Eating it, some claimed, conjured long-lost memories. But then, Ambrosio said, things had gone horribly wrong. . . .
By the time the two men exited the telling room that evening, Paterniti was hooked. Soon he was fully embroiled in village life, relocating his young family to Guzman in order to chase the truth about this cheese and explore the fairy tale-like place where the villagers conversed with farm animals, lived by an ancient Castilian code of honor, and made their wine and food by hand, from the grapes growing on a nearby hill and the flocks of sheep floating over the Meseta. What Paterniti ultimately discovers there in the highlands of Castile is nothing like the idyllic slow-food fable he first imagined. Instead, he's sucked into the heart of an unfolding mystery, a blood feud that includes accusations of betrayal and theft, death threats, and a murder plot. As the village begins to spill its long-held secrets, Paterniti finds himself implicated in the very story he is writing. Equal parts mystery and memoir, travelogue and history, "The Telling Room "is an astonishing work of literary nonfiction by one of our most accomplished storytellers. A moving exploration of happiness, friendship, and betrayal, "The Telling Room" introduces us to Ambrosio Molinos de las Heras, an unforgettable real-life literary hero, while also holding a mirror up to the world, fully alive to the power of stories that define and sustain us. Praise for "The Telling Room"
"A gorgeous and impassioned monument to the art and mystery of storytelling, "The Telling Room" is rich, funny, humane, devastating, and beautiful. It made me want to applaud, it made me want to cry, it made me want to move to Spain. Michael Paterniti is a genius." --Elizabeth Gilbert, author of "Eat, Pray, Love"
"Unforgettable . . . a must-read for all who think of Spain as magical, who consider cheese as the ultimate gift of love, who love stories of betrayal, despair, revenge and redemption."" 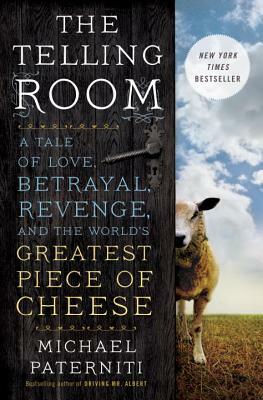 --The Wall Street Journal"
"Elegant, strange, funny, and insightful, "The Telling Room" is a marvelous tale and a joyful read, a trip into a world peopled by some of the most remarkable characters--and, yes, cheese--in memory." --Susan Orlean, author of "The Orchid Thief""
Michael Paterniti is the "New York Times" bestselling author of "Driving Mr. Albert: A Trip Across America with Einstein's Brain." His writing has appeared in many publications, including "The New York Times Magazine, National Geographic, Harper's, Outside, Esquire, "and "GQ, "where he works as a correspondent. Paterniti has been nominated eight times for the National Magazine Award, and is the recipient of a NEA grant and two MacDowell Fellowships. He is the co-founder of a children's storytelling center in Portland, Maine, where he lives with his wife and their three children.